Electrocardiography is the process of recording and measuring the electrical activity of the heart over a specific period of time. The information gathered is transferred to graph paper and the results are analyzed by your Cardiologist. An electrocardiogram is a non-invasive, painless test. The heart is basically a muscular pump made up of four chambers – the two upper chambers are called atria and the two lower chambers are called ventricles. The natural electrical system of the human body causes the heart muscle to contract to pump blood through the heart to the lungs, and throughout the rest of your body. The Electrocardiogram test is performed by placing electrodes on the skin to detect the tiny electrical changes that arise from the heart muscle’s electrophysiologic pattern during each heartbeat. All of the electrodes are connected to the Electrocardiograph (the heart monitoring device) by special cables. While it is a commonly performed cardiology test, sometimes your EKG results may look normal even when you have heart disease. An EKG cannot, on its own, simply and accurately predict whether or not you will have a heart attack. For this reason, your Cardiologist uses the EKG data in conjunction with your medical history, your symptoms, and the results of your last physical exam. If necessary, other cardiac-related tests may be performed as well. The results from an EKG will show your heart’s electrical activity as line tracings, called waves, on graph paper. The spikes and dips in the waves can depict the rhythm of the heart beating while pumping. An EKG or ECG can be used to measure the size and position of the heart chambers, the presence of any damage to the muscle cells in the heart, the rate of heartbeats, the functioning of implanted pacemakers, and the effects of cardiac medicines. Ambulatory Electrocardiograms record the electrical activity of your heart while you carry on doing your usual activities. It means that you are able to walk around during the test. These types of tests may be referred to as Holter Monitoring, 24 Hour EKG, or 30 Day Cardiac Event Monitoring. A Stress Electrocardiogram is performed while you exercise or walk on a treadmill. Prior to your Electrocardiogram, there is no need for any special preparation such as fasting. Simply continue taking your prescribed medications as required and wear comfortable loose clothing with a shirt that opens in the front. Avoid applying any lotions, creams, or powders that day as they can prevent the sticky pads from properly adhering to the skin. A small area of the chest may need to be shaved for the sticky pads to adhere on some men. You may be asked to remove any jewelry from your neck, arms, and wrists. Your EKG/ECG may be used as part of your physical examination or used to monitor the treatment of an existing heart condition. If you are in the hospital, your heart may be constantly monitored by an EKG system, especially during the use of Anesthesia. Prevention is always the best option, so we strongly endorse focusing on your heart health to stop or decrease the chance of developing a heart condition. Major risk factors include having unhealthy blood cholesterol levels, high blood pressure, diabetes, smoking, and being overweight or obese. A lack of physical activity or a sedentary lifestyle can worsen the risk for developing heart disease. While the test is called a 12 Lead ECG (or Resting 12 Lead EKG), it only requires the placement of 10 electrodes, attached to the human body using sticky pads with conductive gel in the center. Two of the electrodes are actually part of two pairs so they each provide two leads. All of the electrodes are connected to the Electrocardiograph (the heart monitoring device) by special cables. The Holter Monitor is an ambulatory type of electrocardiogram used to monitor the ECG tracing continuously for a period of 24 hours or longer. Electrodes (small, plastic adhesive patches) are placed at certain locations on the chest, arms, and legs. When the electrodes are connected to the machine by lead wires, the electrical activity of your heart can be measured, recorded, interpreted, and printed out for informational records and further interpretation. Your Cardiologist may request for you to undergo a 30 day period of cardiac event monitoring to assist in the evaluation of a variety of symptoms to determine if they are directly related to a condition of your heart. Symptoms may include an irregular heartbeat, heart palpitations, chest pain, feeling lightheaded, dizziness, rapid heart rate, or fainting. The monitor can also be used to evaluate the results of a certain medication or the effectiveness of a recent cardiovascular procedure. A 30 Day Cardiac Event Monitor is similar to a Holter Monitor, but since the majority of patients may not have cardiac-related symptoms every day, a Cardiac Event Monitor may be a necessary diagnostic tool. An Exercise Stress Test type of EKG is also often called a Treadmill Test or Exercise ECG. This test is performed while you walk on a treadmill or use a stationary bicycle, and the purpose is to monitor your heart rate and rhythm during stress or exercise. 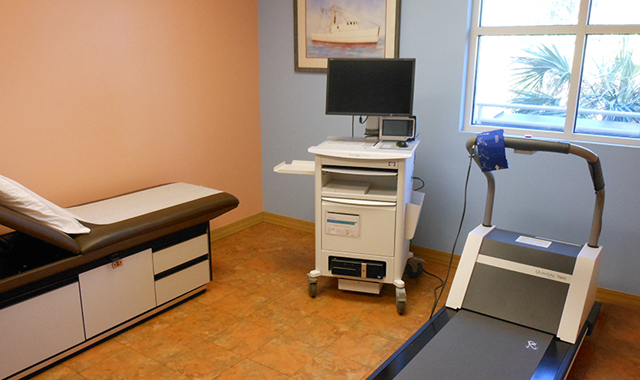 Your breathing and and your blood pressure rates will also be monitored during the procedure. The exercise test can be used to assist your Cardiologist in detecting coronary artery disease, or to determine your safe levels of exercise following heart surgery or a heart attack. A Nuclear Stress Test uses the same method, but also incorporates imaging tools and involves injecting a radioactive dye into your bloodstream to measure the blood flow through your heart while you are at rest and while your heart is working harder – as a result of physical exertion or due to a medication. The nuclear test can show the areas of your heart affected by low blood flow or a damaged heart muscle. A Nuclear Stress Test Electrocardiogram may be used to help guide your treatment if you have been diagnosed with a heart condition, or if your doctor suspects that you may have coronary artery disease and a routine stress test failed to pinpoint the cause of your chest pain or shortness of breath.